This soft Whole Wheat No Knead Bread uses just four ingredients, requires NO kneading, and proofs in the Instant Pot to save serious time! This bread is kind of too good to be true. It takes just minutes to mix up, and there’s no kneading involved. The loaf you’ll get is crusty on the outside, soft and airy on the inside. 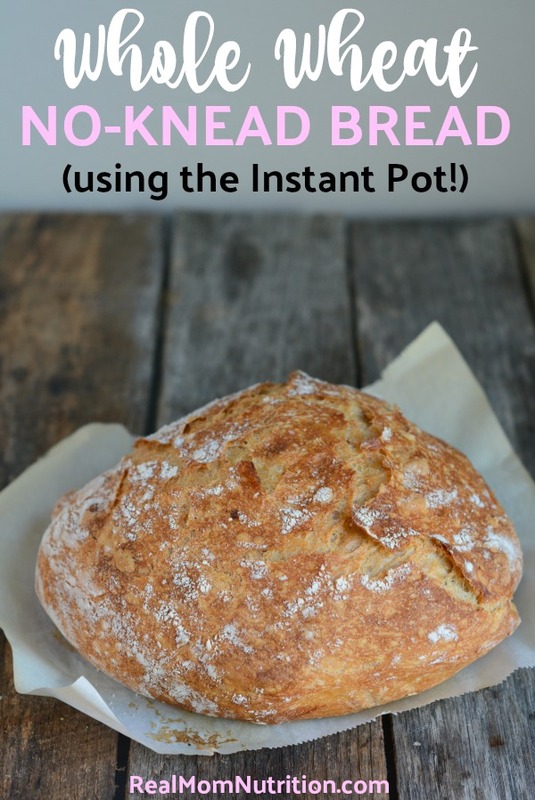 And using your Instant Pot, you can start in the afternoon and have fresh, warm bread ready in time for dinner. I also added a technique I picked up from the Instant Pot Facebook Community that saves serious time: proofing the dough in the Instant Pot! A 1.4-L Pyrex bowl fits perfectly inside the Instant Pot Duo. If you don’t have one, you can get one on Amazon here or here or find a similar-sized bowl that will fit inside your Instant Pot (with the trivet set on the bottom). If you don’t have an Instant Pot, you can still make this bread. Just follow her instructions for proofing the dough at room temperature. You’ll just have to wait a little longer. If you don’t have a Dutch oven, you can find a list of alternate bakeware that work just as well in her Notes. Whisk together both kinds of flour, yeast, and salt. Stir in the lukewarm water until the dough comes together in a shaggy mass (you may not use all of the water called for). Only stir just until it comes together. The more you stir and work the dough, the fewer air pockets you’ll get inside the loaf (and air pockets are a good thing!). 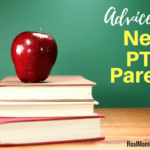 Cover the bowl with plastic wrap and set the bowl inside the Instant Pot on top of the trivet. Place the lid on Instant Pot and set on the Yogurt setting. This will take 3.5 hours. 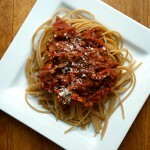 When it’s done, it will look like this (a bit bubbly and sticky-looking). 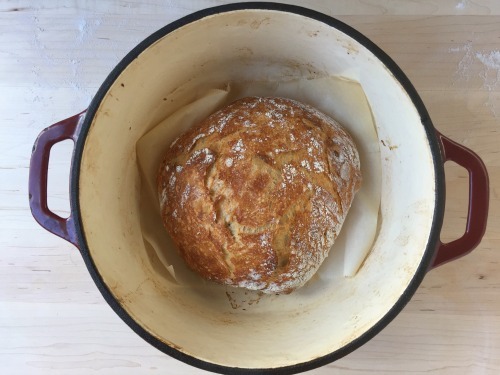 Place your Dutch oven (or other oven-safe bakeware) in the cold oven and set the oven at 450 degrees F.
Turn the dough out onto a floured surface. It will be very sticky, and you may need a spatula to scrape all the dough from the bowl. Using floured hands, shape into a ball and cover loosely with plastic wrap until the oven reaches 450 degrees F.
Carefully take your pot out of the oven. Place a small piece of parchment at the bottom of the pot and place the dough on top. Cover the pot with an oven-safe lid and bake for 30 minutes. Uncover the pot and bake an additional 7-15 minutes until the bread becomes nice and brown. I use a thermometer to make sure the internal temperature is at least 190-200 degrees F (this is the thermometer I use). Here’s what it looks like when it’s done. This bread is best on the first day (preferably slathered with soft, salted butter). Store any leftovers in an airtight container or bag and use within two days. Whisk together flours, salt, and yeast. Stir in water until dough comes together in a shaggy mass. Don't stir it too much! Cover the bowl with plastic wrap and place in your Instant Pot on the trivet set down inside. 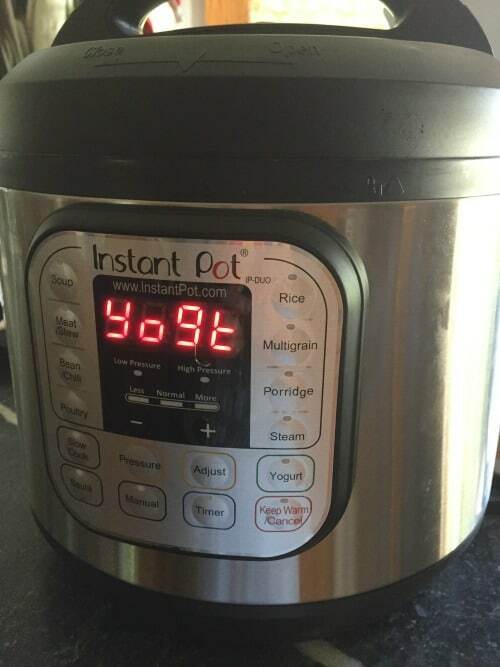 Set Instant Pot to the "yogurt" setting (about 3.5 hours). When the time is up, place a Dutch oven (or similar oven-proof pot) in your oven and set to 450 degrees. 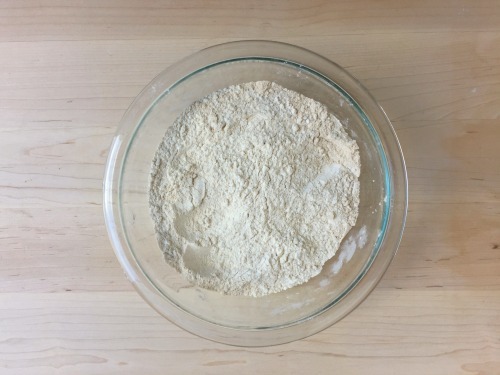 Turn dough out of bowl onto a well-floured surface. It will be very sticky, and you may need a spatula to scrape all of the dough from the bowl. 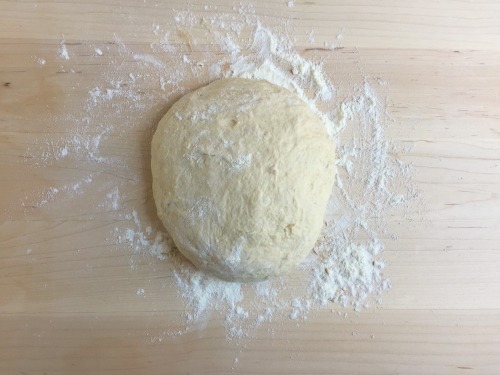 Form dough into a ball with floured hands. Loosely cover the dough ball with plastic wrap while your oven preheats. 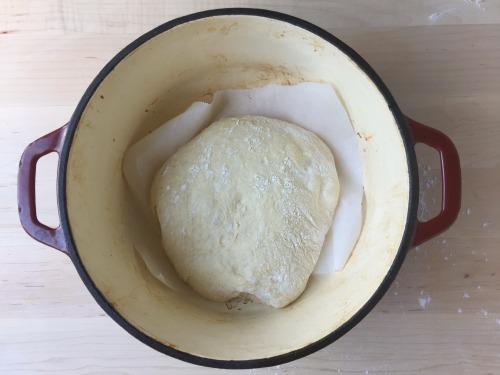 When the oven reaches 450 degrees, carefully remove the pot from the oven, place a small piece of parchment paper on the bottom of the pot, and set the dough on top of the paper. Cover and bake for 30 minutes. 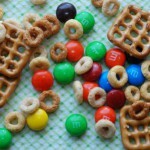 Remove the off the lid and bake an additional 7-15 minutes or until golden brown. 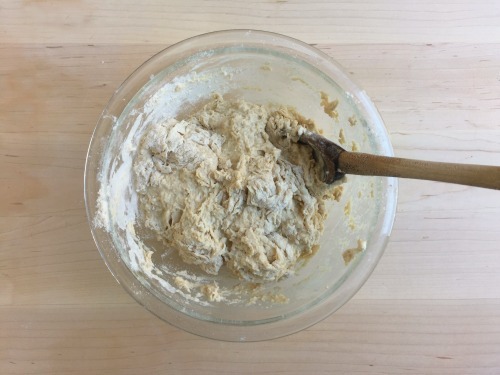 Note: One reader found that activating the yeast first helped her loaf become much lighter and airier. She added the yeast and salt to the warm water (temperature of the water was 110 degrees). She let it sit a while until she saw some bubbles and then added the flour, stirring just enough to mix it. Then she followed the rest of the directions as written. If your loaves are too dense, give that a try! This page contains Amazon Affiliate links. If you purchase a product through these links, your cost will be the same but I will receive a very small commission to help with operating costs of this blog. Thanks for your support! Cannot wait to try this! Do you add any water under the trivet in the IP? I’ve never used the yogurt setting and I’m used to adding at least a cup of water/liquid when using the IP. Hi Sarah–No, I don’t add any water to the IP. I don’t have a yogurt setting on my Instapot. What is a work-around setting. 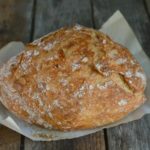 Hi Barbara–I’d say your best bet is to follow the instructions on the original post and proof it on your counter (http://www.thecomfortofcooking.com/2013/04/no-knead-crusty-artisan-bread.html). Do you put the Pyrex bowl directly into the IP or in the stainless pot inside the IP? I put the stainless pot inside the IP, put the trivet in, and then put the Pyrex bowl inside of the stainless pot. I made the no knead bread the conventional way, proofing it overnight, last night and it came out so great. Just read proofing it in my IP and what a fantastic idea. Going to try it tomorrow. I would like to make rolls instead of one big loaf. Have you tried dividing it up into rolls before you put it on your parchment paper inside your Dutch oven to bake? I would think it would make fantastic rolls taste wise but wondered if they would would all run together since the dough is so sticky. I don’t like using plastic wrap….Could I cover with a silicone lid or Would that mess it up? Hi Lauren–I don’t know how warm the IP gets on the yogurt setting. I would think you could use a thin, clean kitchen towel, but not sure. I wouldn’t put anything tight on top that would limit the expansion of the dough (plastic wrap “gives” when the dough rises, so would a towel). The alternative to plastic is parchment, but if your silicone can by used inside a microwave I would guess that it is safe to use in the IP. 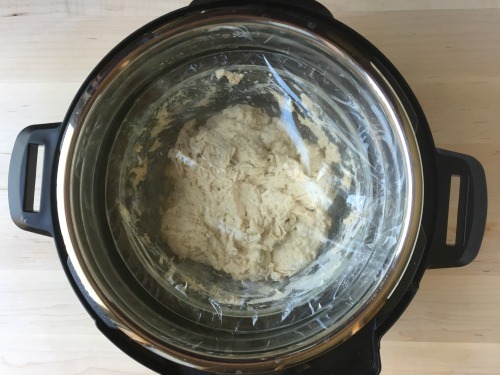 Do you set the instant pot to sealing or leave on venting when using the yogurt setting to proof bread dough? Thank you! I set mine on seal. Hi Sally! 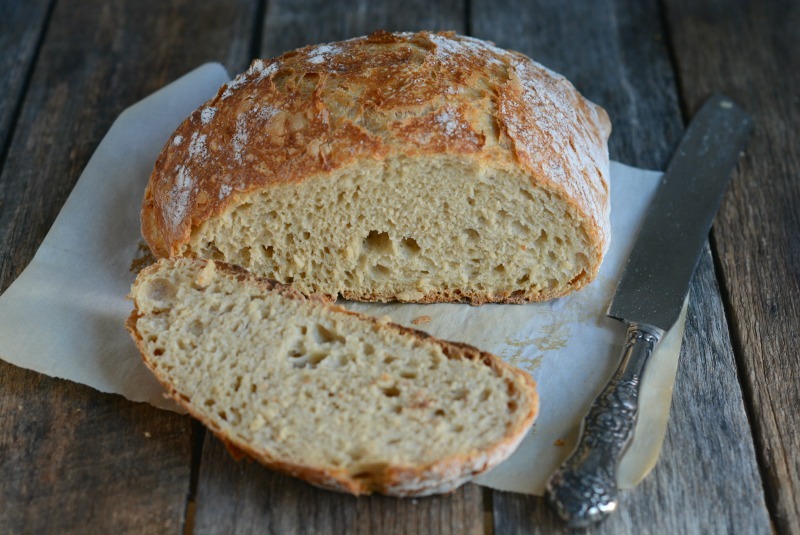 This looks wonderful, I am hoping to make this bread tomorrow. Have you ever tried it with a gluten free all purpose flour? I just got an instant pot and have only used it for soups and stews so far and don’t want to damage it by switching up the ingredients. 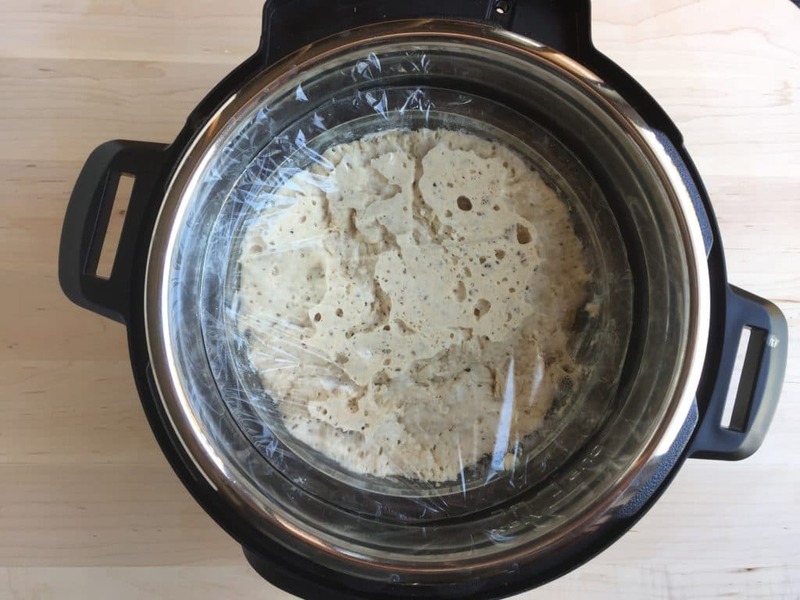 Another blogger wrote that it could damage the seal if correct ratios aren’t used when baking bread in the instant pot. I would love to hear your thoughts! Thanks! Hi Kerry–I haven’t tried it with gluten-free flour so I can’t say for sure. You only proof it in the Instant Pot, it bakes in the oven, so I don’t think the ratios would affect the seal. Good luck and let me know if you have success with the GF flour! I just made this using half WW flour and adding a sourdough starter. Activating the yeast first is a must if you keep your yeast in the fridge like I do. It’s gorgeous. Looks just like the picture. My mother is amazed I made it in 4 hours start to finish! I’m so glad to hear that Nicole! Sourdough bread is something I haven’t tried yet but would really like to. Otherwise, you could always just proof it on the counter as in the original post from Comfort of Cooking. I have made this bread for a long time. Great idea on the yogurt setting. That is one button I thought I would never hit! Just a twist…I lowered the salt and added about a quarter pack or less of lipton french onion mix. The bread smelled and tasted delicious! Great with Gruyère cheese. Next up is to try a jalapeno version. Thanks. I just made yogurt in my instapot and have a lot of whey left over. 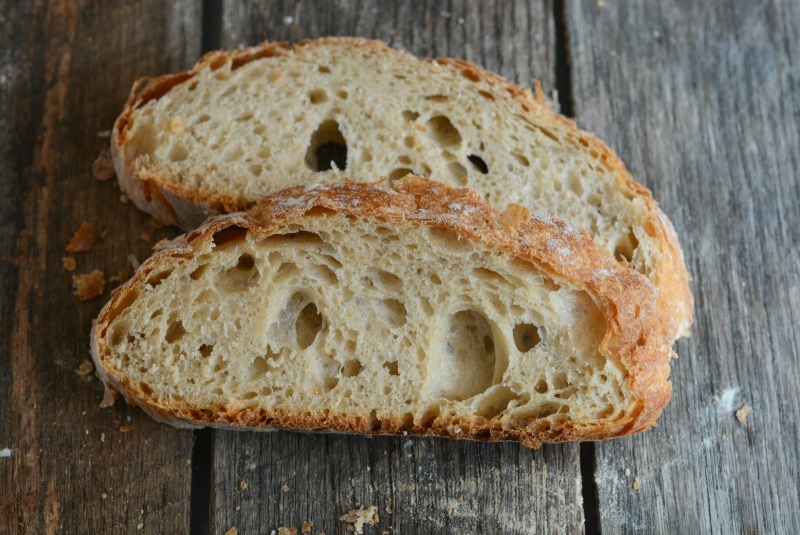 Do you have a recipe for bread using whey? Or do you think I could substitute the water for whey? I’ve read that whey makes a good substitute for sourdough starter. I don’t–sorry! But I’m sure there are uses for it. Curious did you tried with the whey? I haven’t–but if you do, let me know how it turns out! If you activate the yeast in water first, do not add salt to the water, add a teaspoon of sugar. The sugar will feed the yeast. Salt will kill/retard the yeast. Add the salt to the dry ingredients. The crust on this is fantastic. Can’t wait to try different flavor combinations. So happy I found this post! I’ve been making no-knead wheat bread for the past year. 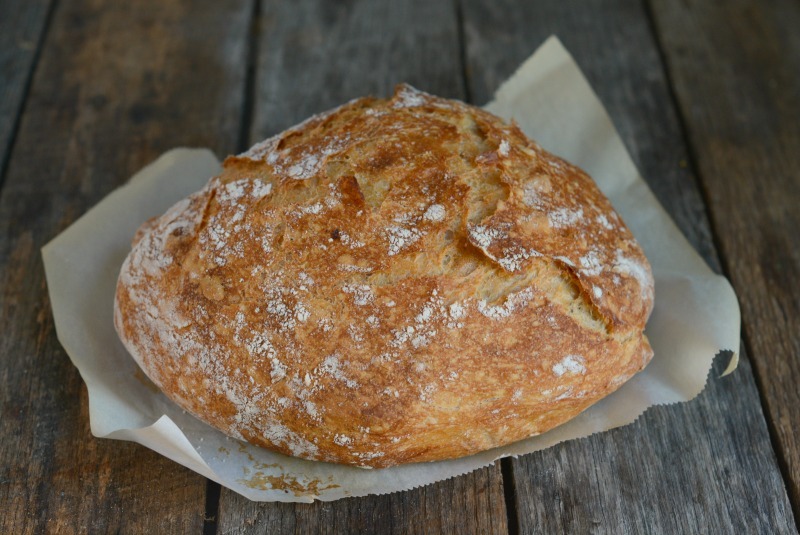 I don’t mind mixing the bread and letting it sit overnight, but too often I (or my husband) forgets to mix it in the evening, so the next day I’m disappointed and thinking I have to wait another day. This is going to be terrific! I’m making some kalamata olive bread today! I’ll still probably use the countertop method most of the time, but I’m so happy to have a way to speed the process! I use instant yeast straight from the freezer, and I”ve never had to proof it, so I’m guessing maybe the people who have issues with that are using regular yeast? 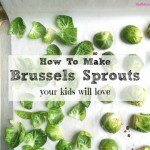 I have never…..ever…had a problem with this recipe. Looking forward to trying the instant pot method. Thank you! Thank you for the recipe. I find that most bread recipes are a hit and miss because we all have different pots pans and ovens. I plan on starting with this tomorrow.